Mbodies Pilates Studio Education breaks new ground by offering Qualified Pilates Matwork Teachers, Part trained but not Certified Apparatus teachers or Medical professionals i.e. Physiotherapists to enter the world of the Pilates Studio accepting their current Professional Status and to progress down a range of Modules as far as they need to go to meet their needs whilst being covered by Insurance whilst teaching the public. For more information about our Studio training carry on below ! The Mbodies Studio Pilates Brand encompasses the creation of stand-alone CPD education modules which cater for those looking for an introduction to Apparatus Pilates to support and progress an existing knowledge of Pilates based Matwork exercises. The modules are stand-alone – which means that they can be taken in isolation. However when taken in combination with other modules delivered but not created by Mbodies. These modules combine to provide a modern and effective entry level Studio Pilates qualification which allow the customer to work effectively as a studio instructor and then build further on this qualification to advance the studio qualification with specialisms which lead to more advanced studio qualifications. 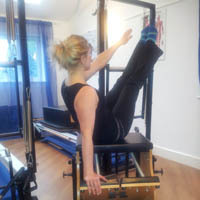 Mbodies Studio Pilates modules have been designed ‘out of the box’ and do not conform to the traditional approach to Pilates Apparatus Education in the UK which demand many years of training and a mortgage to achieve a qualification which allows any revenue generation. Instead the Mbodies team focus upon the business of running a studio, the essential focus on safety and the business need for studio craft and versatility in the instructors who work within the studio. The modules have been designed ‘bottom up’ with reference to the Mbodies Team’s joint experience of owning and running 11 UK and USA-based Pilates studios between 1995 and 2015 ranging from small studios of less than 50 square metres up to the largest UK dedicated Pilates studio with 600 square metres dedicated to Pilates Apparatus training. This 20 hour course covers the needs of the UK Insurance industry to ensure that all participants completing the module and its formative and summative assessment are competent in 3 areas. This 60 hour course is normally broken into three 20 hour segments and provides participants with their basic 'toolbox' of exercises on the Reformer, Cadillac, Chair and Barrels. The Instructor demonstrates and teaches participants how to perform with good style, teach safely and effectively exercises to clients and support/spot where needed. Where appropriate related repertoire is taught across all relevant apparatus types alowing discussion and an understanding of when,and why to choose one piece of apparatus in preference to another for a particular client and exercise. Participants enrolling on this module consolidate the teaching of Repertoire, Induction, Teaching techniques and Class Planning modules and then finally take a final written and Practical assessment which pull all of the taught modules together. Assessment in this module is both Formative and Summative comprising Reflective analysis of others teaching on Apparatus, Own practice on Apparatus and teaching clients. The final summative assessment is in the form of a Multiple Choice test and a practical assessment where you will bring a client and teach a pre planned 30 minute session and then demonstrate and teach some repertoire suggested by the examiner.